Smoothie is such a magic drink for the mothers of all picky eaters. A smoothie is a blended beverage made from fresh fruits. They can also contain milk, yogurt or ice cream. In addition to fruit, many smoothies include crushed ice, frozen fruit, honey. You can make a healthy and yummy drink out of anything and kids won't even ask what's inside. 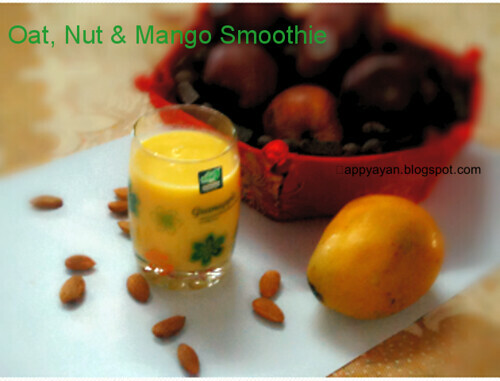 I have prepared this smoothie with rolled oats, almonds and fresh mango. Delicious, quick and filling drink for summer afternoon light meal. My daughter loved it. 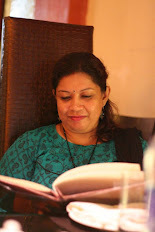 Not only she loved it, she also clicked a photo and edited it for my post. Thanks dear. Soak the almonds in little hot milk for about 10 minutes. This will help to remove the skin of almonds easily. Remove the skin and keep aside. Soak also the rolled oats in milk for about 1/2 an hour. Chop the mangoes. Now in a blender, add soaked rolled oats, soaked almonds, chopped mangoes and yogurt. Blend well until smooth. You can add milk to adjust the consistency of your smoothie. Add sugar, blend again. You can also add some ice cubes, if you want. 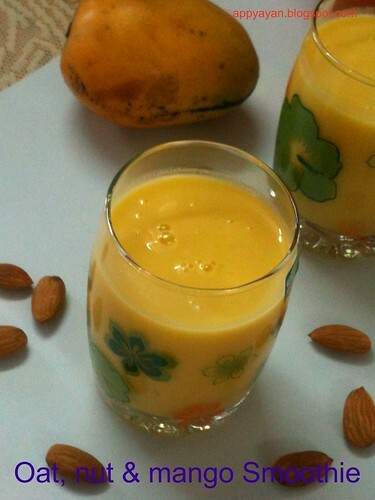 Pout into a big glass and enjoy the goodness of oats, nuts and mango. This smoothie is going to take part in my ongoing event, Spotlight : Summer cooler. wow..very delicious n nutritious with nuts!! so delicious and equally nutritious! wow very nice and healthy smoothie with an awesome summer fruit!! Want to have it now itself. Perfect way to start a day, seasonal recipe,yummy it looks! Thats an excellent and super filling smoothie. 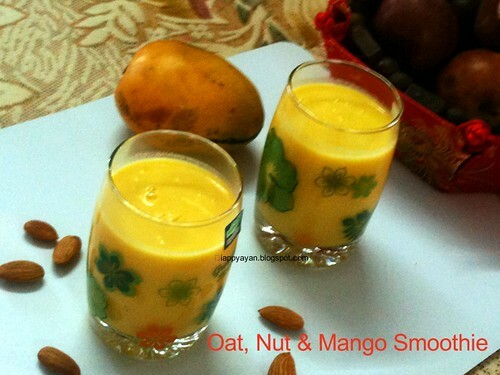 Must try smoothie with oats, hope it tastes gr8..
Just got a box of mangoes so will try this recipe today.